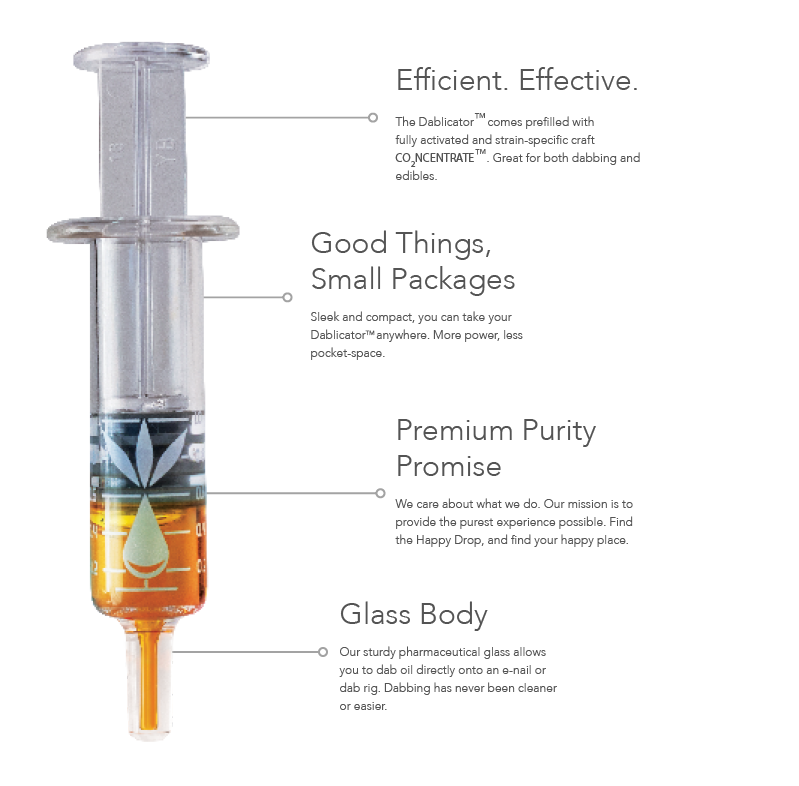 The High Desert Pure Dablicator™ is a glass applicator prefilled with strain-specific fully-activated CO2NCENTRATE. It’s great for dabbing as well as for making your own edibles. Since it’s glass, not plastic, you can dab directly on a hot dab rig. For the chefs among you who want to make your own edibles, we even include a handy dosing worksheet in each package and on our website, to help you do the math. The DablicatorTM comes prefilled with fully activated and strain-specific craft CO2NCENTRATE.TM Great for both dabbing and edibles. Sleek and compact, you can take your Dablicator anywhere. More power, less pocket space. We care about what we do. Our mission is provide the purest experience possible. Find the Happy Drop, find your happy place. Our sturdy pharmaceutical glass allows you to dab oil directly onto an e-nail or dab rig. Dabbing has never been easier or cleaner. What should I do with the cap? Take it off, but keep it on hand. When you’re done dabbing, put the cap back on. How do I use the Dablicator? Dab oil directly from the glass dispenser onto your e-nail or dab rig of choice. What if my oil is too thick? Really struggling to get any oil out? Run your Dablicator™ under warm (not hot) water for a few seconds. My Dablicator's just not working. We’re sorry to hear that! If you have a defective Dablicator™ (non-user failure), give us a shout at info@highdesertpure.com or return it where purchased for a replacement or refund. Keep it cool–you don’t need to crank your dab rig up to 800 degrees for a pleasant experience. But can I experiment with temperatures? Go for it! Dabbing at different temperatures allows you to explore the different terpenes and flavors that are vaporized at different points. Figure out what works best for you. Can I use my Dablicator to make edibles? Heck yeah! Our craft cannabis oil is fully activated. We already converted the THCA into THC for you, so you can use our oil for making your own edibles at home. No heating required! How much extract should I use for an edible? Depends on the dose you want. Check out our edible calculator below to help you get the perfect recipe. Edible calculator time! Enter values below to determine how much extract to use. Remember that 1/2 gram of extract is 500mg. 1 gram = 1000mg. Refer to the testing label on the box your Dablicator™ came in for information regarding the total THC %.